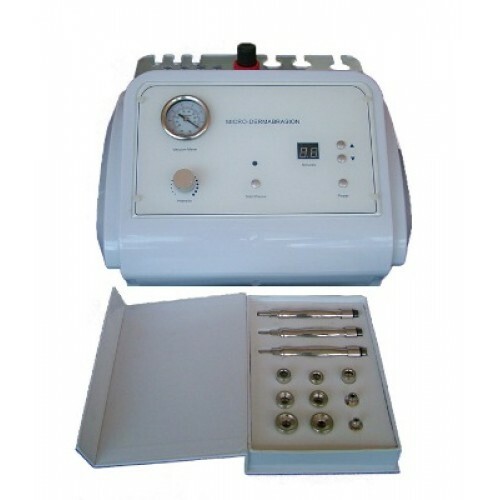 This device is used for mechanical cleaning of the skin. Applying it, you can solve numerous problems of therapeutic clarification of skin, treatment of hyperpigmentation, acne rash, seborrhea, elimination of hems, wrinkles and folds. This clarificationeffect arises after treatmentof chosen skinsites by microcrystals of dioxide of aluminumunder pressure. Crystalsclean off layers of the skin, influencing mechanically. Besides, these oxides have also therapeutic effect: they provokean increase of metabolism in skin cells. Moreover, it leads not only to clarification, but also to improvement of skin’s appearance. For such various impacts on the skin, the device has a number of replaceable manipulators with various nozzles. Except the electronic block with the blower, there is a separate pouch,which holds three manipulators with nine workers nozzles. The maximum universality of use of this device is therapeutic treatment of the skinsurface and improvement of its vital indicators.